State University of New York Press, 9780791476000, 306pp. In contemporary American life, community has become a portable phenomenon--you can "get it to go" wherever and whenever it is desired at the push of a button, mouse, or keyboard. In Portable Communities, sociologist Mary Chayko examines the social dynamics and implications of having access to countless others at any time. Teeming with the observations of people who blog, email, instant message, game, and chat on cell phones, wireless computers, and other portable devices, the book captures the appeal and the excitement, the challenges and the complexities, of online and mobile connectedness. Chayko considers some of the external dynamics that emerge as these communities resonate within the larger society--constant availability, social interaction that is more controlled and controllable, and new opportunities for self-expression, creativity, and even voyeurism. Internal social dynamics involving emotionality, intimacy, play, romance, and networking are also fully explored. 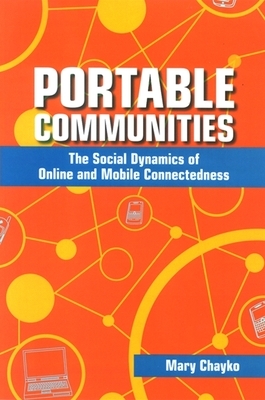 Portable Communities provides a unique view of shifts in the social landscape and points the way toward needed social and political change. Mary Chayko is Professor of Sociology at the College of Saint Elizabeth and the author of Connecting: How We Form Social Bonds and Communities in the Internet Age, also published by SUNY Press.